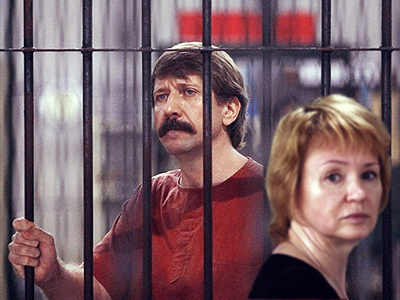 Alla Bout, the wife of arrested Russian businessman Viktor Bout, has been allowed to see her husband for the first time since he was extradited from Thailand. RT met with Alla to get her take on the most personal issues. The meeting is scheduled for Monday, January 24, and will last for three hours. 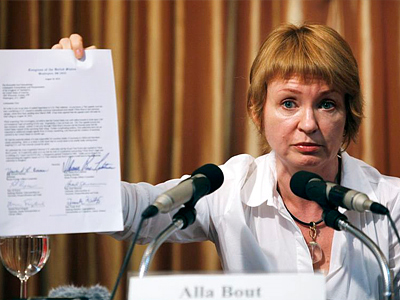 Alla believes that a meeting of such length was permitted because Viktor Bout's 16- year-old daughter Lisa and his 74-year-old mother Raisa will be also present. 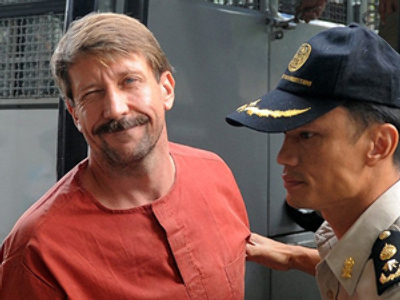 Viktor Bout, who once served as a translator in the Soviet Army, was arrested in Thailand in March 2008 during a sting operation orchestrated by US agents. What followed was a two-year legal nightmare for the “Merchant of Death,” as he has been dubbed in the Western media. RT:Alla, thank you for joining us today. You arrived in New York two weeks ago, your first visit since the extradition of your husband in November. Have you been able to get in contact with him? Have you been able to see him yet? Alla Bout:The two weeks have passed by very quickly, and unfortunately Viktor and I did not have a chance to meet. It appeared that the process of issuing documents in jail is very long. We had to prepare and fill out certain forms, submit Liza’s birth certificate saying she is his daughter, submit our marriage certificate saying I am his wife. I don’t know how we are going to prove that I am the mother, it’s not easy, but I think that everyone will take it at face value. On Monday we will be allowed our first meeting that will last about three hours. RT: Have you at least been able to speak to him over the phone? AB: No. I didn’t have a chance to speak with him over the phone. We talked only once before the New Year. He is experiencing very tough conditions, still staying in an isolation ward. He is not allowed to make any phone calls, though practically all the detainees are entitled to them. He can make one phone call a month lasting 10 to 15 minutes to one family member. RT: You have been hoping to get Viktor released on bail as he awaits trial here in New York. Do you think that is possible considering he is being held in solitary confinement while US officials try to figure out if he is a menace to society and the fact that it is such a high-profile case in the US? AB:Well, you know, it’s more of a formality. We were refused release on bail in Thailand many times, and I think this will also be the case here. But I am guided by the principle that it is better to at least try doing something, than do nothing at all. But I definitely don’t expect this to happen. RT:Western media have been alleging that Viktor’s assets make up as much as $6 billon and we have been reading that you have been saying that this is not true at all and that you essentially have no money left. Can you comment on that? AB:Well, indeed the mass media have been saying this and will continue to do so, I am sure. And the closer we are to the hearing, the more information will appear. As for the 6 billion – a huge amount of money – mentioned, allegedly it was the Finance Ministry that seized Viktor’s assets to the tune of 6 billion rubles. Well, it raises a question: if Viktor did have such huge assets in New York – in American – banks, then there is – probably not a law – but a rule in place saying that if those assets do exist, then they may be used to pay the lawyers, they may be withdrawn and used to pay Viktor’s lawyers. And I am asking, where those assets are, show them to me. Why can’t we pay for the lawyers with the money that has been seized? Well, I know it for sure that Viktor has never had any assets in the United States; he has never made any transactions or had any bank accounts in the United States. That’s one of the big lies surrounding Viktor for more than 10 years. So, if there are no assets, it’s quite logical that no deals have been made. RT: There are about a thousand pages of documents, from what is being reported, that were presented to your husband when the charges were made against him and many people are saying, where there is smoke there is fire. If the allegations against him have been fabricated, who is it by? AB: As for the saying there’s no smoke without fire, I believe that first they made up the smoke and then the fire. Today’s charges are totally different from the charges the American media were presenting for about 10 years starting from 2000. So, they began with the UN reports where the word “allegedly” was always used. Then it all became overgrown with rumors and other data. The media have never given any specific names of the people they got the information from. Therefore, it’s unclear where the journalists got those facts from. When I was trying to find out where that data was coming from, I discovered that one journalist was referring to another one, who was referring to yet someone else. As a result, we face a kind of a blind alley. Then the question is who provided that data to the American journalists. Where were those journalists getting all that information from if not from their wild imagination. Who provided them with the information and for what purpose? Viktor has spent the last 10.. 8 years in Russia, in Moscow. And we’ve been constantly getting the information from the American press that his aircraft were making some flights, that he himself was making some trips, while I knew that he had closed his business in 2001, as he had gone bankrupt and sold out everything. So, the airplanes never existed, he didn’t work abroad, he didn’t have any companies, he wasn’t transporting anything. His business had been totally liquidated. He was staying in Russia. But still once in a while, some messages appeared that Viktor was seen in one place or another. But then probably it was someone else? 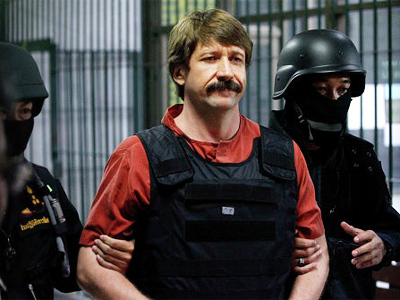 So, it appears that over the past 8 years the United States have made a personification of evil out of Viktor, and now they have no other problems, but for Viktor Bout: no Osama Bin Laden, no Al Qaeda, no problems in Afghanistan, no problems in Iraq, the only problem is Viktor Bout. 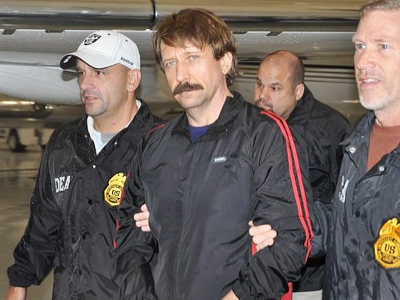 And now that they have detained Viktor Bout, who’s such a villain, they’ve got no more problems. RT:Why would they want him that much if he is completely innocent? AB: I don’t know. I think that we should address this question to the media, who allegedly know so much about Viktor, or to the American special services, for example. Why on earth do they need Bout? Why have they been creating this kind of image, making a kind of a legendary character out of him by writing books and making films about him? Where did they get the money for it from? What I know is that if Viktor had headed home from Thailand – and he was supposed to go home as he had won two court cases. I also have a lot of questions, which I can’t answer. What I can do is just speculate. RT:Officially, Viktor’s documents remain in a Thai court of appeal. What are your lawyers saying about this? Is it technically legal? What does it mean for the extradition, the fact that his case is still continuing in Thailand? AB:We have a very funny story here. Currently, the lawyer cannot find a single document signed by the Thai Cabinet on Viktor’s extradition, which should exist according to the Thai government. This means that nobody has signed any documents, no written permission on his extradition has been issued. The lawyer is now trying to understand who gave the permission on his extradition from Thailand. Prime Minister Abhisit Vejjajiva said that he knew about it. But he did not give any such instructions. So, Viktor was simply kidnapped by this means. By all appearances, it was some kind of political decision. Probably the United States simply demonstrated to the whole of the world that it can arrest any person, who is not an American citizen – on the territory of any country simply because it “needs the person” as it was mentioned by different people, including congressmen, and why they need him is nobody’s business. It means they wanted him despite the fact that they lost two court hearings, were refused extradition, the criminal case in Thailand was closed, but they simply wanted him. They wanted him and that’s it. According to the Thai Prime Minister, he did have a conversation with President Barack Obama, but that he did not call because of Bout and that they were discussing iPads. This happened right before Viktor’s extradition from Thailand’s territory. RT: Do you ever wonder if there is something that your husband might have not told you, especially considering that the United States has been wanting him and keeps wanting him so much? AB: I’ve been married to Viktor for 18 years. I am totally convinced that one person can never know everything about another one even after having spent their whole life with them. But when you love a person and you’ve lived with him for such a long time, you at least feel what this person is capable of. The charges presented by the US media and picked up by the mass media of other countries are simply absurd, because Viktor is a man of principle. He will never get involved in any schemes with any odd person. RT:There are so many cases in history when a wife would find out that her husband is a serial killer and she is shocked and she never knew, or that he was cheating, or that he was a criminal and so on and so forth. Where does that belief of yours come from? AB: There was a time – we lived in Moscow then – when we spoke of it a lot and I asked him very often what on earth was going on. I could never understand this, because I saw it with my own eyes that he was at home, while some unbelievable things were being said about him. And I asked him if he could explain it. And he answered that he didn’t know. He said that may be they had his double. And I asked him why not take them to the court. And he answered that it was beneath his dignity and it was complete nonsense. His business was growing before my eyes. I know practically all the employees who worked in the Arab Emirates, in South Africa. Those are numerous witnesses who can confirm what the company was dealing with. RT: Do you think that it’s possible that your husband might have some information that would be of interest to the US government? AB: I concede that Viktor possesses some information that may be of interest to someone. But I have a question then. Why doesn’t it cross the mind of the Russian government, or of the government of some other country that there are people possessing such valuable information? Why aren’t those governments trying to extradite the person by making huge efforts – spending huge money from the state budget, spending taxpayers’ money? As far as I know, Michael Brown said in one of his interviews that they had spent at least 15-20 million dollars to detain Viktor Bout. RT: You were not allowed to have the vice-consul join you when you were being held at the airport for several hours when you arrived here in New York City. Do you ever wonder if you are being watched or followed by US officials in one form or another? AB: I arrived officially and openly, as I was allowed entry. What I would like to understand is whether I will have another chance to get here after having left, as there are rumors that I may be refused another entry, because I am the wife of a terrorist according to their allegations. And though nobody has proven anything yet, they already say that I am the wife of a terrorist and can also be a menace. Well, I don’t know what kind of threat I can present. If they really think that Viktor is a terrorist and I am the wife of a terrorist, why not follow me then to find out where I go and whom I meet. Maybe I have something bad on my mind. So, it’s quite possible. However, if it is true it’s being done very tactfully. But judging by what the lawyers have told me, there is one thing that I have realized is that if we decide to fight, they think it might be dangerous for me. As the case is so complicated, I may experience any kind of pressure, meaning that any measures may be taken including my arrest for some kind of minor mistake. They said that I must realize what I’m doing and that there will be pressure exerted on me, and obstacles will be created. They are saying that there is no need in court hearing, because a lot of negative facts will be revealed, which are relevant neither to the US government, nor to the US special services. RT:What about Viktor himself? Has he been talking to you about whether or not pressure has been exerted on him somehow to make him cooperate in this case? AB: Yes. When he was transferred by airplane from Thailand to the United States, he was offered something like political asylum. It seemed strange to me. Witness protection program, relocation of the whole family to the United States… It seemed to me to be a strange proposal. If they do believe that he is a terrible terrorist, why offer him political asylum? He never hid from anyone. He doesn’t possess any Russian political secrets. That’s what is unclear. He has received no other proposals, as Viktor said. He has a Russian mentality. If he is convinced in something, if he is sure about his innocence, then he thinks it’s up to them to try and prove the contrary. It’s not Viktor who is to explain himself, it’s them who have to prove that he did this. AB: The most difficult moment was when all of a sudden Viktor was extradited to the United States. For some reason, I was confident that he would go home, as there were no legal grounds for extradition. We won two hearings. We practically won the hearing. So if this country complied with its own laws and its own constitution, Viktor would have been at home by now. How can we talk about presumption of innocence and democracy in the country, if the prosecutor is already talking about Viktor being crazy about killing American people? What does it mean that he’s crazy? Killing what people? So, as Viktor puts it, it’s nothing but brainwashing. He is being presented as international crazy murderer. And they are already talking about a life sentence. Isn’t it an information war? I am a living woman, and I have normal reactions. When I can, I cry out loud, when I can’t, I cry inside. Of course, it’s very hard for me. Almost three years of this madness, which I hoped would end in Thailand, are starting over again in the United States. And I understand today that what happened in Thailand was baby talk compared with what will happen here. RT: What will you do if he gets a life sentence and remains behind bars for the rest of his life? AB:You know, I must be confident that at least we’ve done everything we could. If there is justice, and if there is democracy and independence the US is so proud about, if there is a presumption of innocence the law is based on.. if it really exists, then I still have hope that we may win this case. Of course, we will try to do so. But you know, when every third, fifth or tenth person reading local papers and watching local TV-channels sees what is being said there – and they are saying that Viktor is a terrible person, that he is a menace to American people – how can we talk of a just hearing? RT: Alla Bout, thank you very much for your time with us today.